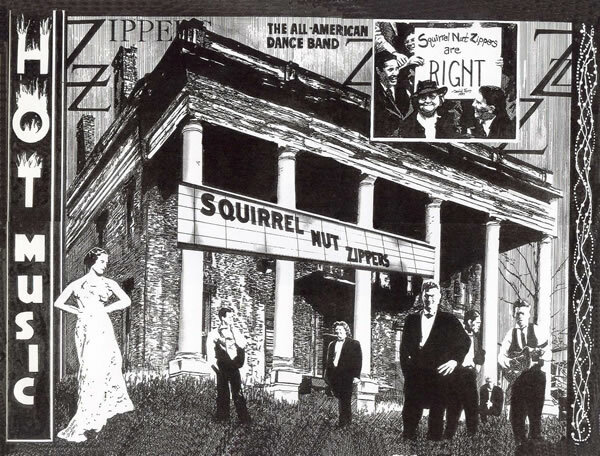 For a while there, I was asked to do the promotional materials for “The Squirrel Nut Zippers” (a jazz/dance-hall/”retro” band of Chapel Hill locals that found themselves suddenly, if sorta-unintentionally, famous in the late 90’s). I really didn’t know much about them (before someone at Mammoth Records In Carrboro, NC telephoned me) beyond what I’d heard through the local restaurant mafia. For better or worse, there was a long while there when every waiter or waitress in Chapel Hill and/or Durham had at least one gratuitous masters degree in the humanities….and I knew of some of the band members only because I knew where they had worked in local restaurants. In any case, I liked their music a lot….and I did posters and other odd stuff for the record company (which had been founded by a Sewanee alumnus and which was eventually sold to Disney, as I recall). I recall that one of problems with the record projects was that, in 1998, I didn’t actually OWN any CD’s or a CD player. I have no idea why the record company was so patient with me at that stage of the game.